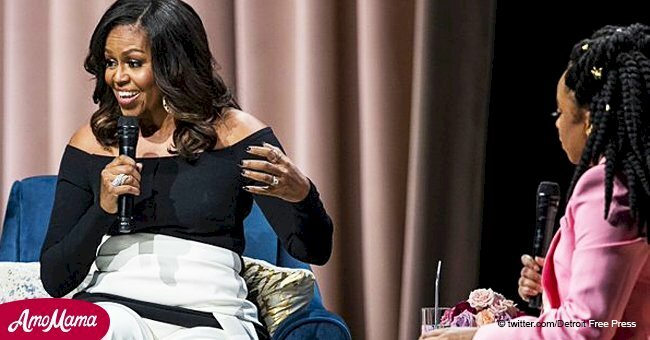 During an appearance on the “Tonight Show” on Tuesday night, Michelle Obama sat down with Jimmy Fallon to promote “Becoming,” her memoir and shared the very personal reason why Barack wanted a second term as president. "I've always said, as quiet as it's kept, the second term of the presidency was really fueled by Barack's desire to keep them with their agents into their teen years." "He was like, 'We've got to win because I don't want those girls walking around.' He wanted men with guns with them. He worked extra hard on those votes. He's like, 'Come on voters!'" 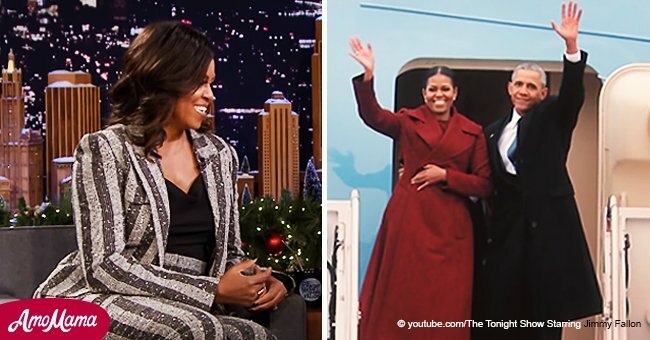 At the time their daughters, 14-year-old Malia, and 11-year-old Sasha were in their early teens when Barack got inaugurated for his second term in the White House. Read more on our Twitter account @amomama_usa. After the family left the White House, they decided to stay in Washington D.C. until after the now 17-year-old Sacha finished high school. While Malia, now 20, is a second year at Harvard University. 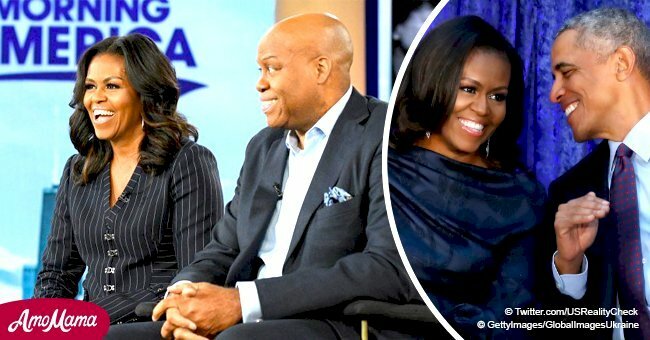 Jimmy and Michelle continued to talk about her memoir, and how she could write a whole book just about the White House. 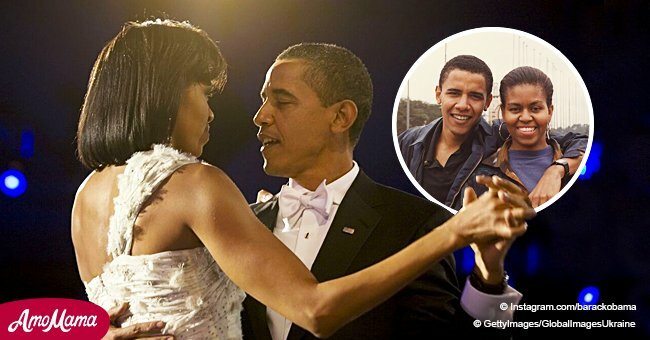 This prompted Jimmy to pull out a picture of Barack and Michelle standing on top of the stairs to AirForce One; they were both smiling broadly, waving. It was their last flight as it was the day they left the White House. The audience roared with laughter while Jimmy almost fell off his chair, and Michelle sat with a massive grin on her face as Jimmy tried to compose himself. 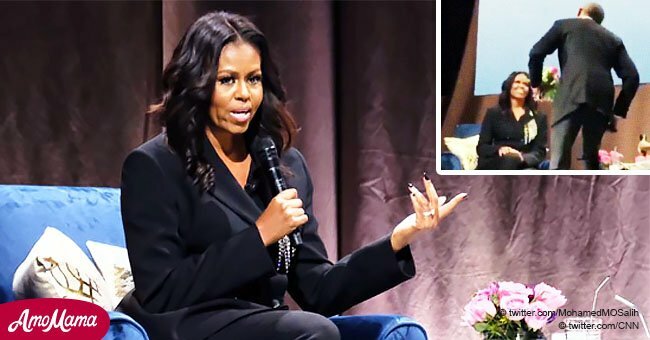 Michelle Obama seems to be on a roll with her quips during interviews and speeches lately. Just over a week ago during her last stop of the book tour of her memoir, ‘Becoming,’ at the Little Caesars Arena in Detroit as she made the crowd roar with laughter with another one of her quips. "We can't make mistakes. We can't get indicted." "There is a difference in standards. We are seeing that right now. We live with double standards all the time."